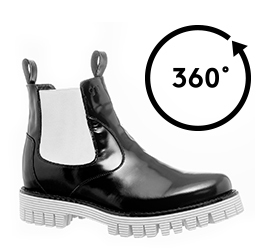 It's the Black and White upper in patent full grain leather to put a sheen on the new "China" boots by GuidoMaggi. A fusion of two essential colors that blend perfectly with winter fashion 2017. The outsole is ribbed rubber, super lightweight in timeless white. The tank thread outsole in natural rubber 100% Italian with anti-slip - cushioning and impact resistant - will also allow greater walking stability even with the highest inner increasers. The side elastic bands are made of pure silk to ensure the ultimate luxury and refinement. The inner height increaser, invisible and anatomic, can be chosen - as needed - between 2.4”, 2.75”, 3.1” or 4 inches. GuidoMaggi's artisans allow wide possibilities for customization.